Your pressure washer can provide hot water cleaning power by just connecting a heater. Hot water cleans 30% faster than cold water, and cuts the need for detergent by about 50%. Over time, with the savings in both labor time and detergent, these heaters pay for themselves. A Hot Box (a.k.a. 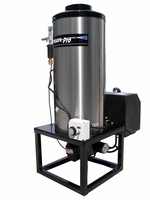 Water Heater) is an inexpensive way to add the power of HOT WATER to your cold water power washer. These industrial-grade heaters are skid mounted, and the compact size makes it is easy to add one your existing trailer or van set-up. If you need hot water to be competitive and you already own a cold-water pressure washer, this is the most inexpensive way to achieve that. Available in either 12 VDC or 120 VAC configurations, you have complete flexibility with one of these hot boxes. Schedule 80 coils. #2 Diesel fuel is ideal for these units. Constructed with powder-coated steel frames and a super-efficient Schedule 80 Beckett coil with a stainless steel wrap, there heaters will deliver 120-130 deg rise in temperature. 115VAC hot boxes require a source of AC power, such as a wall outlet or a generator. 12VDC hot boxes can be powered through 12-volt vehicle wiring or by a deep-cycle battery. If you use a battery, you must recharge it regularly. The #1 reason for burner failure is low voltage, so make sure that the voltage supply is always adequate. Consider buying "oversize" to get faster heating and a higher temperature rise. A 8GPM heater provides about twice as much heat, so it operates less frequently and heats much faster that a 4GPM heater, for example. That is why the 6GPM heater is the smallest one we offer here. Call us if you want a price on a 4GPM hot box for your power washer. These units are usually built to order, so please allow 10 - 20 business days for delivery of your hot box!